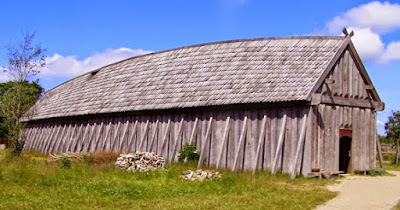 According to Marianne Hem Eriksen, it is striking that the three-aisled longhouse persisted for nearly 3000 years of Scandinavian prehistory – especially when considering the major upheavals that occurred throughout this period. ‘Many have pointed to architecture as a fundamental expression of the ideology prevailing in a specific culture. Especially in societies that have no written language, architecture takes on special importance as a collective expression of the organization and mindset of a culture,’ she points out. The period from the early Bronze Age to the Medieval period was characterized by huge and fundamental social, political and religious upheaval. Towards the end of the Bronze Age the chieftains ruled, before the bronze networks of that age collapsed. The centuries preceding the birth of Christ are said to be characterized by equality and egalitarianism. This period was followed by the rise and fall of the Roman Empire and the Age of Migration with its great movements of migrant populations – this could indeed be described as ‘Europe on the move’. In addition, we have the Vikings and their raiding and colonization towards the end of the first millennium AD. ‘Throughout this period, people in Scandinavia continued to build their houses in more or less exactly the same way as before. That’s really intriguing,’ the archaeologist says. Eriksen's recent work focuses on the ritual importance of these houses; for example, when they had decayed to the point that they needed to be replaced, they were often burned and a burial mound erected over the remains. Literary sources tell us that certain key posts ("high seat pillars") were removed and taken to the new house. I think the rituals are interesting but I do not think they are necessary to explain the long use of this design. I think it survived because it was a perfect fit for the society and environment of Bronze and Iron Age Scandinavia. This was a land of long, cold, dark winters, and the basic test of any house design was whether it could keep people warm with a limited use of fuel. These windowless longhouses fulfilled that basic function. More, they provided a way for people to get together in the dark season and pass the time in company. 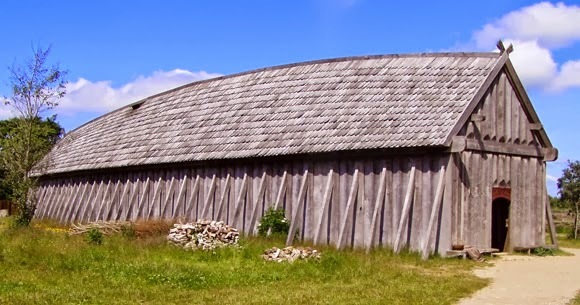 Each of these longhouses belonged to a chieftain and they were large partly to accommodate a lot of guests. In the three-aisled design, the two outer aisles were usually divided into small spaces for semi-private sleeping quarters, storage bins, and the like, but the center aisle was a common space. There the folk of the stead could gather for feasts or drinking bouts, to hear skalds recite ancient lays, or just to talk. These gatherings kept up the morale of the people and also reinforced the prestige of the chieftain. 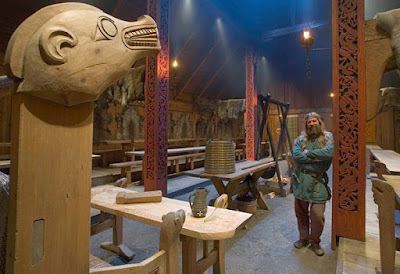 Think of the hall of Heorot in Beowulf, a place of light, comradeship and safety amidst the stormy, monster-haunted world. Rather similar structures crop up in Native American architecture on both sides of the continent, as well that of numerous Pacific Islands, and even places in mainland Southeast Asia such as Vietnam. It seems that there are some shared attributes we can pick out. For all these different people, the primary building material is wood rather than stone. They also all live in climates with somewhat extreme temperatures, either very cold or very hot periods of the year that must be endured. Somewhat less obviously, they're also all from wet climates, and possibly an important part of the longhouse was to create and maintain a dry environment through the use of indoor fires, regardless of the temperature. In basically all cases, longhouses were not just communal centers, but also a vital source of storage space for perishable goods. A high roof makes it much safer to have a fire indoors, and allows the smoke to spread out and thin. It also provides a lot of space to hang goods from the rafters, or to erect lofts. It also helps regulate the temperature, as a larger volume of insulated air takes longer to warm or to cool, and you can make adjustments using smoke flaps in the roof, either increasing or reducing the rate of temperature exchange with the outside. And it's also just a lot cozier to have a high roof and feel less bottled up and penned in when stuck inside during your local variety of extreme (and wet) weather, such as a snowstorm or a typhoon. Beaten Down by the Rain. "Prioritizing These Three Things" Etc.